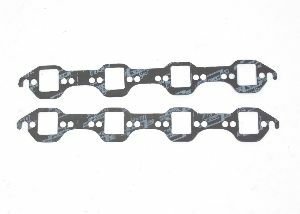 Showing 1 - 10 of 10 Products for Exhaust Manifold Gasket Set. Rectangle Port Shape; Port Dimensions W-1.12 in. x H-1.48 in. Port Size: 1.120 In. X 1.480 In. Mr. Gasket has three types of exhaust gaskets--standard, Ultra Seal, and Copperseal. Use the standard for a stock rebuild and the Ultra or Copperseal for extra blowout protection. Port Size: 1.250 In. X 1.750 In. What sets us apart as a company in the automotive industry? Many things come to mind, but most importantly is our knowledgeable team of employees. They are qualified and dedicated professionals who are experts in the automotive industry, and most are racers and enthusiasts themselves, including Mr. Gasket's President, Mr. Bob Romanelli. People with first-hand interest and knowledge of this industry, who create and apply new concepts based not only on research and numbers, but on personal experience and hands-on know-how. Our staff of enthusiasts apply their knowledge to product engineering, research and development, product management, and marketing services. Members of our technical service group have an average tenure exceeding fifteen years. That's not just dedication to a career, that's commitment to something they truly believe in. Port Size: 1.300 In. X 1.400 In. Oval Port Shape; Port Dimensions W-1.25 in. x H-1.75 in. 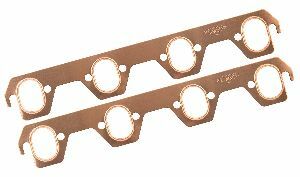 Copperseal exhaust gaskets are unique gaskets made from .043 inch solid copper. They feature an embossed O-ring design for a leak proof seal. They won't shrink, deteriorate or blowout. Header bolts stay tight. Ideal for motor homes and towing.